Aliness Liposomal Vitamin C is a dietary supplement in liquid form containing sodium L-ascorbate, potassium L-ascorbate and L-ascorbic acid collectively known as vitamin C. In comparison to other products with a similar composition, Aliness Liposomal Vitamin C is distinguished by an innovative form – active substances are encapsulated in a fatty acids coating (liposomes), thanks to which their absorption from the digestive system significantly increases. For this reason, the recommended daily dose may be smaller than if the same amount of vitamin C was dissolved in water. This dietary supplement was produced in the Premium Absorption Technology, which guarantees very high bioavailability and, as a result, rapid and efficient absorption by the cells. This technology is based on certified and patented raw materials, and its clinical action has been confirmed by the research of Nano-Nutri Technology TM. Vitamin C is a water-soluble compound belonging to the group of unsaturated polyhydric alcohols. Naturally, it occurs mainly in foods of vegetable origin (fruits and vegetables, e.g. citrus, parsley, pepper), but also in animal products. Vitamin C activity is systemic – from improving immunity and cardiovascular function to protein transformation or free radical scavenging. Another function of vitamin C also includes the production of collagen, and as a consequence, ensuring the proper functioning of blood vessels, skin, cartilage, bones and gums. Vitamin C protects cells from stress, both directly and indirectly, because it helps in the regeneration of vitamin E. Scavenging of free radicals by ascorbic acid manifests itself by strengthening of the nervous system and muscles, as well as slowing down the development of cancer processes. Skin not exposed to oxidative stress remains firm, smooth, and free of wrinkles. Vitamin C also supports the absorption of iron and reduces the feeling of fatigue and weariness. In addition, ascorbic acid influences the synthesis of corticosteroids and some neurotransmitters. Research also confirms the existence of a correlation between the appropriate concentration of vitamin C in the body and maintaining a stable psyche. The effects of vitamin C deficiency include scurvy, general weakness, drowsiness, lack of appetite and joint pains. The skin becomes susceptible to damage, the wounds are healing longer and the capillaries become fragile, resulting in visible red petechiae. Smokers are especially vulnerable to deficiency of vitamin C, which is why they often develop characteristic fine wrinkles. The active substance dissolved in water was placed in lipid molecules whose shell resembles the structure of biological membranes. This liposomal system has been used for long now to deliver active substances to the body. Liposomes are easily absorbed in the gastrointestinal tract, and due to their structure, the substance contained in them is protected against digestion in the stomach, which in turn, allows it to reach the intestines – the place of absorption – in intact condition. Vitamin C is unstable and sensitive to high temperatures and light, which is why it is important to store it properly. The packaging (bottle) of the dietary supplement meets the requirements of pharmaceutical standards: it is equipped with a tight cap with a protective membrane, and the color in which it comes is white, which counteracts the photooxidation of the liposomal substance. In addition, the supplement was manufactured in a sterile plant that meets the world’s highest standards, so that there is certainty about the purity of the active substance. In conclusion, Aliness Liposomal Vitamin C is a dietary supplement especially recommended to all those who want to supplement their daily diet with vitamin C. Thanks to its unique form, the supplement is very well absorbed, and used regurally will help to remain the body in a good shape. Take 5 ml once a day with a meal. 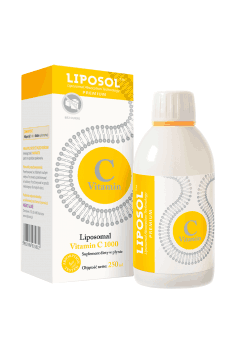 Due to the liposomal form of vitamin C, we recommend consuming it with a meal, preferably a fatty one. The packaging includes a spoon that makes it easy to measure the right dose. Vitamin C should be consumed directly or dissolved in a glass of water or juice. It is not recommended to exceed the daily dose of the supplement, because the symptoms of the digestive system (diarrhea) may occur. It should also be remembered that supplementation of even the most bioavailable vitamin C will not replace a balanced diet rich in fruits and vegetables. The dietary supplement is not intended for pregnant women, nursing mothers, and children. Water, phospholipids (non-genetically modified lecithin NON GMO), humectant (glycerol), preservative (potassium sorbate), ethanol (<2.8%). Complex formulation improving the quality of hair and nails. Inhibits hair loss and stimulates hair growth.